Well I can say that, based on the comments garnered by last Friday’s 1987 Lancia Thema 8.32, most of you don’t like to fly under the radar. No, you’re all more the loud and proud crowd. That Lancia on the other hand was a bit of a Q-ship, and a pretty mundane looking one at that. Combine that with its $32,975 asking and what do you get? Well, in our case you got a massive 86 percent Crack Pipe loss. That Lancia had something that, at the time was noteworthy among automotive engines—overhead cams driving four-valves per cylinder. That’s pretty de rigueur today, but back then it was more the exception than the case. Auto makers started adding multi-valve heads to their engines to improve breathing and hence power. Some makers however, took an older, simpler route to that destination—they just added displacement. Today’s 1990 Chevy Corvette is an example of that mantra of size over sophistication. Under its pointy prow lies a 5.7-litre OHV V8, one of the simplest engine bases there is. That’s an L-98 to you and me with “Tuned Port Injection” or TPI in this particular case. This engine also found its way under hood in the Camaro and Firebird of the time. Here it made 245 horsepower which was a lot back in 1990. Backing up the 5.7 is a four-speed automatic making this ‘Vette coupe a bit more of a cruiser than a bruiser, but again that’s an old school solution to putting those ponies to the pavement. The ad claims that the car runs “really strong,” and benefits from new brake pads and rotors and wheel bearings all around. An aftermarket exhaust is noted in the ad, but no further details other than an image of its four pipes peeking out of the bodywork are offered. The bodywork has been painted in Competition Yellow which is complemented by a coal miner black interior. The leather seats are said to be out of a later ‘Vette. Those look okay, although they are missing their hard shell backs. The exterior shows some wear and tear too, evidencing some cracking in the paint and fraying in the glass along one fender. We don’t get to see more than one side of the car in full view but that’s probably a good thing since the factory wheels here are the kind that go one direction on the left and the other on the right, and that makes me kind of crazy. The major issue here seems to be that the speedo has stopped working. The attempt to repair it has extended to the disassembly of the passenger-side of the dash but seemingly no further. The car is said to be drivable in this state and does come with a clear title. The tags appear to be out of date so there may be some back registration owed when that title is transferred. To do so will require $3,000 as that is the seller’s asking. 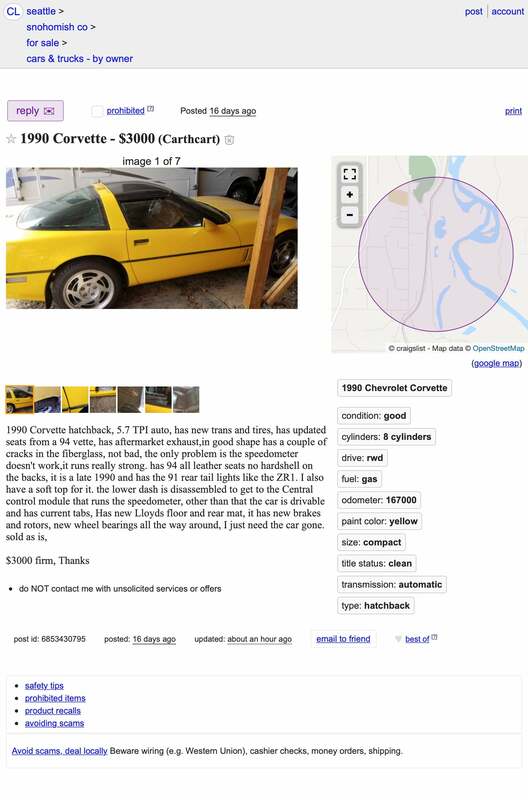 That’s pretty cheap for running Corvette territory, but the question for you is: could that prove to be cheap enough considering this Corvette’s list of liabilities? 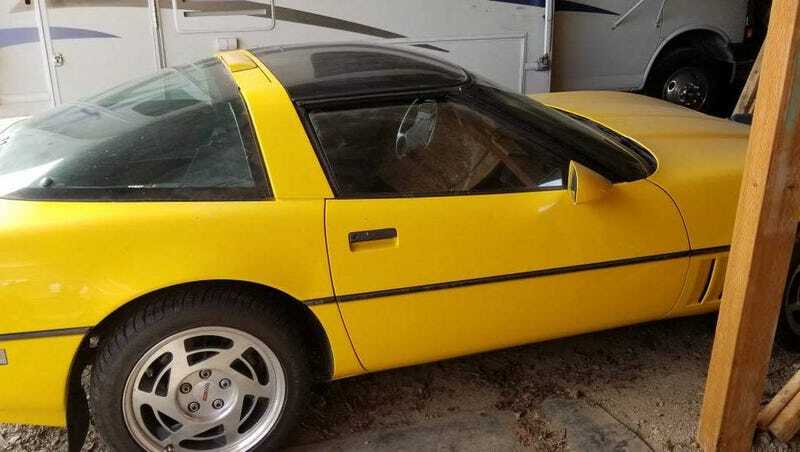 What do you think, is this ‘Vette worth that $3,000 price tag? Or, are this car’s problems too many for the asking? At $4,500, Would You Let This 1968 Chevy Corvette Roller Roll Into Your Life? At $29,500, Could This 1967 Pontiac Tempest Safari “GTO” Let You Make it While You Fake it?